This book is meaty, chunky, chewy, thick and rich. well, it should make you feel content…. 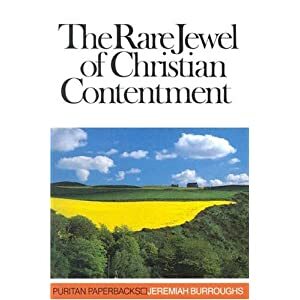 What is the rare jewel of contentment? in a nutshell: Focus. where is your focus? Do you focus on circumstances or God? Focusing on Gods grace is the key, because no matter how bad your life is right now, Gods grace is more abundant. God knows what you need and cares about more than anyone in your circumstances now. Oh, you should answer your friends so who come and tell you that you must be content: No, I am willing to yield to God, and I am freely content. That’s a great book. My favorite thing that Burroughs wrote.